Rick Warren had an enigma on his mantle: a medallion of a double-headed eagle. When I asked him if he knew what it meant, he admitted that he did not know, and asked me. The double-headed eagle is the symbol of the Byzantine Empire, and that symbol carried through to Russia. One eagle represents church, and one the state. The symbol shows the synergy between both. Then, as now, there have been both benefits and drawbacks to such rule. And still, even though our country is founded in opposition to such a principle (we have a one-headed eagle), it was the way of the Roman and Byzantine Empires for more than 1,000 years, until 1453. Similarly, church and state have long been linked in Russia. Perhaps it is the persistence of the double-headed eagle that Americans find so puzzling about Russia. Knowing these things, as an American Orthodox priest, one whose Christianity is the same as Russia’s, Nancy Folbre’s Dec. 23 column in the New York Times, “President Putin’s Patriarchal Games,” caught my eye. Her politico-religio-social commentary, thinly veiled in an article about the Olympics, was laced with accusations against Russia, her Orthodox church and her president, Vladimir Putin: bribery, power, coercion, environmental corruption and abuse against women. She found it impossible to avoid the tired references to Putin’s former KGB days and even compared him to Joseph Stalin. Her column made me wonder: What makes journalists, professors (she taught economics at UMass) and the general public so concerned about Russia, the Russian church and Putin? Russia, like all nations, has domestic priorities. That is, an emphasis at home and in the home. Russia, as part of the Soviet Union, has seen the face of atheism and Communism at home, where 70 years and more than tens of millions of deaths equaled more Christians martyred in Russia in the 20th century than all the Christian martyrs total in the previous 1,900 years. What didn’t kill Christianity in Russia made it stronger. Perhaps Russia is eager to return to her unabashedly Orthodox Christian culture and morality. To appreciate that possibility, consider the professor’s words: “long history.” It is nearly impossible for us to fathom in our individualistic society, where the Constitution guarantees no established religion, and where we have 217 varieties of disparate Christianities, that Russia has had not just Christianity, but a single Christian faith and moral vision for almost 800 years longer that our country has existed. Russian Orthodoxy predates the Magna Carta by nearly 250 years and antedates Christopher Columbus by double that. The end of Communism in Russia coincided with the celebration of 1,000 years of Christianity there. That, indeed, is “a long history.” A long, rich history of prayers, piety and morality, a foundation without which Communism and atheism would have won out. Rather than taking offense at Russia’s “traditional views,” might it be timely for us to remember that America shared a similar moral vision with Russia for the first 200 or so of our short 238 years of American history? It is a mystery to me why there are people who find it difficult to believe that women are biologically endowed to be mothers and men to be fathers, the “traditional gender roles” about which Folbre writes. What does all of this have to do with the Olympics in Russia? Very little, except that Russia’s “traditional domestic policies” have led to suggestions of boycotts and continue to elicit all sorts of ranting about they way Russians are governed. Besides less-than-private toilets and terrorist-related security, it is Russia’s firm moral stance that is written about most with respect to Sochi. It might be helpful to note that Orthodox Christianity is not so much a formal religion that can be treated, remolded or cast aside like an outdated custom. Rather, it is said to be the longest-standing unchanged, living Christian tradition in the world. It is the Christian tradition that continues to hand down Jesus’ teaching about what it means to be truly human. And with respect to the Olympics, it is helpful to recall that St. Paul compares living the Christian life to that of an athlete in training and competition. 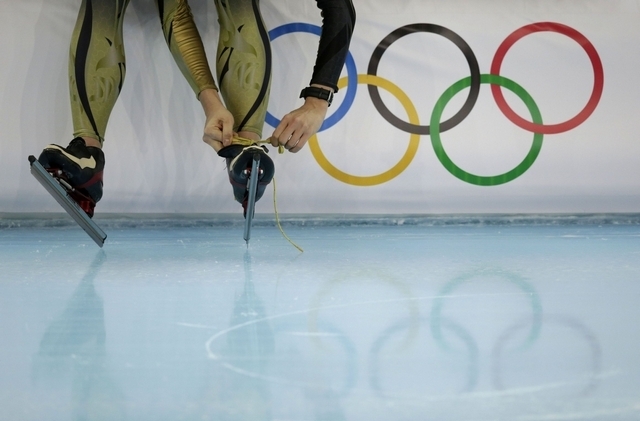 He said, “An athlete is not crowned unless he competes according to the rules.” An ice skater cannot win the gold, or even compete, wearing skis. The Sochi Olympians from the world over have followed strict training regimens in order to be victors. Christians likewise, Russian Orthodox in this example, are called to exercise self-control and to follow a strict training regimen to be holy and truly human, according to Jesus’ teachings. And this to receive not a perishable medal, but a crown in heaven. Father John Parker is pastor of Holy Ascension Orthodox Church in the I’On Community of Mt. Pleasant. Reach him at frjohn@ocacharleston.org or 881-5010. This Is the Acceptable Time, Let Us Repent!